The Ultrastar pistols are smaller and lighter guns for carry and concealment. 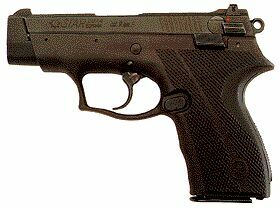 A single-column pistol in either 9 mm Parabellum or .40 S&W cal., their primary feature of interest is a polymer frame. This is constructed with steel inserts and a ribbed magazine well for extra stiffness and strength. Fitted with a straight barrel instead of a cone, the Ultrastars are lightweight and well-suited for their intended role, with even the safety lever fit flush when on 'fire.' These guns are based on a prototype M-105 with an aluminum frame and plastic grips. The alloy gun never reached production.